Developed by Dave Munsie of JGOWare, Retroshoot is a game that, for lack of a better term, is pretty freaking awesome. It’s almost as if the ship from “Geometry Wars” broke free from its arena and embarked on a mission through the retro-gaming universe. 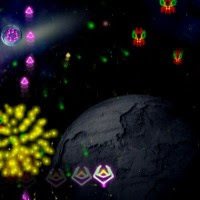 You’ll begin by blowing up asteroids and geometric shapes, but will eventually encounter iconic enemies straight from the old-school of video games. Your mouse will control the ship, which will automatically fire, and you can continue up to three times before it’s “game over.” Don’t let the simple controls fool you though – some of the levels are tough as nails. A suite of five different power-ups also keeps the action from getting old. In addition to the killer presentation and liberal use of particle effects, enemy types and patterns are varied well from level to level. Certain levels are played horizontally, and some are played vertically. The screen automatically rotates at the end of each level, depending on what’s coming up. There are even some intermediary stages that seem rather boss-like. You’d think that a game of this type might not justify 40 levels, and in most cases, you’d be right. Retroshoot is one of those rare exceptions to the rule proving that even older gameplay ideas can be combined and retooled to provide a fresh and entertaining experience.